The bench is displayed on the Western side of Alba Carolina Citadel, next to the road entrance of the Citadel. Wooden bench made by team Kooho, 4 meters long with a 2,5 meters high back rest. 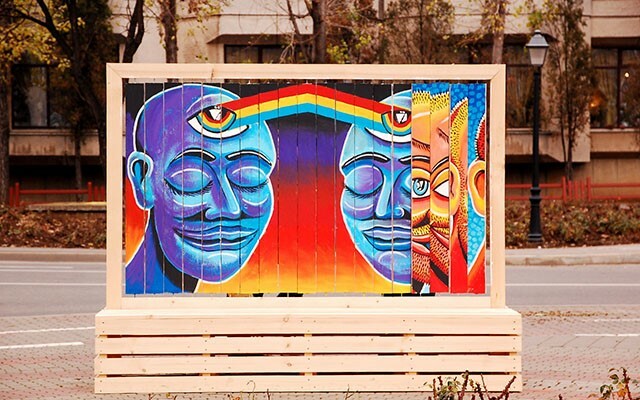 The back rest is made of wood panels and displays the illustration of artist Nicolae Aurel Duță („Kitră”), as a minimalist approach of the idea of Romanian national identity. The bench is displayed inside Alba Carolina Citadel on the pedestrian route between The Union Hall and the main building on The National Union Museum. Wooden Pavilion Tunnel -made by Kooho team- 5 meters long, 1,5 meters wide and 2,5 meters tall, with separate wall elements, gap in ceiling for a panorama of the sky. It reminds of the trenches where the Romanian soldiers fought in the Independence War and World War I- essential battles for the fulfillment of the centuries long time dream of all Romanians, the Union. The Pavilion is displayed on the Western side of the Alba Carolina Citadel, near the 4th Gate, and is visible from the pedestrian routes and the roads inside the Citadel. Wooden cubical pavilion – by Kooho team- entry accessible, opaque frame- windows on walls and ceiling, set towards the main historical spots, with subtle contours, inviting the passerby’s to discover it. The pavilion is set on the pedestrian route at the corner of Union St. with Pacii St., next to “The Coronation Cathedral”. Wooden Darkroom- by team Kooho- entry accessible, with historical photographs of the Union and reinterpreted photographs of the post- Union eras displayed on the walls. The sun projects the photographs on the opposite wall, similar to positive transparency. The Darkroom is displayed in the “I.L. Caragiale” park, near the Student’s Culture Hall , where, back in 1918, there was a club of the “high society” of the city, where business men, lawyers, magistrates and professors put together the actions that lead to the moment of the 1st of December 1918.